For other uses, see Battle of Algiers. The Bombardment of Algiers (27 August 1816) was an attempt by Britain and the Netherlands to end the slavery practices of Omar Agha, the Dey of Algiers. An Anglo-Dutch fleet under the command of Admiral Lord Exmouth bombarded ships and the harbour defences of Algiers. Bombardment of Algiers, 1823, by Martinus Schouman. There was a continuing campaign by various European navies and the American navy to suppress the piracy against Europeans by the North African Barbary states. The specific aim of this expedition, however, was to free Christian slaves and to stop the practice of enslaving Europeans. To this end, it was partially successful, as the Dey of Algiers freed around 3,000 slaves following the bombardment and signed a treaty against the slavery of Europeans. However, this practice did not end completely until the French conquest of Algeria. Following the end of the Napoleonic Wars in 1815, the Royal Navy no longer needed the Barbary states as a source of supplies for Gibraltar and their fleet in the Mediterranean Sea. This freed Britain to exert considerable political pressure to force the Barbary states to end their piracy and practice of enslaving European Christians. 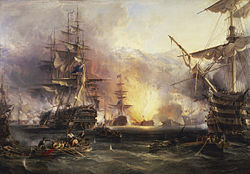 In early 1816, Exmouth undertook a diplomatic mission to Tunis, Tripoli, and Algiers, backed by a small squadron of ships of the line, to convince the Deys to stop the practice and free the Christian slaves. The Deys of Tunis and Tripoli agreed without any resistance, but the Dey of Algiers was more recalcitrant and the negotiations were stormy. Exmouth believed that he had managed to negotiate a treaty to stop the slavery of Christians and returned to England. However, due to confused orders, Algerian troops massacred 200 Corsican, Sicilian, and Sardinian fishermen who were under British protection just after the treaty was signed. This caused outrage in Britain and Europe, and Exmouth's negotiations were seen as a failure. As a result, Exmouth was ordered to sea again to complete the job and punish the Algerians. He gathered a squadron of five ships of the line, one 50-gun spar-decked frigate (HMS Leander), four conventional frigates (HMS Severn, Glasgow, Granicus, and Hebrus), and five bomb ships (HMS Belzebub, Fury, Hecla, and Infernal). HMS Queen Charlotte—100 guns—was his flagship and Rear Admiral David Milne was his second in command aboard HMS Impregnable, 98 guns. This squadron was considered by many to be an insufficient force, but Exmouth had already unobtrusively surveyed the defences of Algiers; he was very familiar with the town, and was aware of a weakness in the field of fire of the defensive batteries. He believed that more large ships would have interfered with each other without being able to bring much more fire to bear. In addition to the main fleet, there were four sloops (HMS Heron, Mutine, Cordelia, and Britomart), eight ships' boats armed with Congreve rockets, and some transports to carry the rescued slaves. When the British arrived in Gibraltar, a squadron of five Dutch frigates (Melampus, Frederica, Dageraad, Diana, and Amstel) and the corvette Eendragt, led by Vice-Admiral Theodorus Frederik van Capellen, offered to join the expedition. 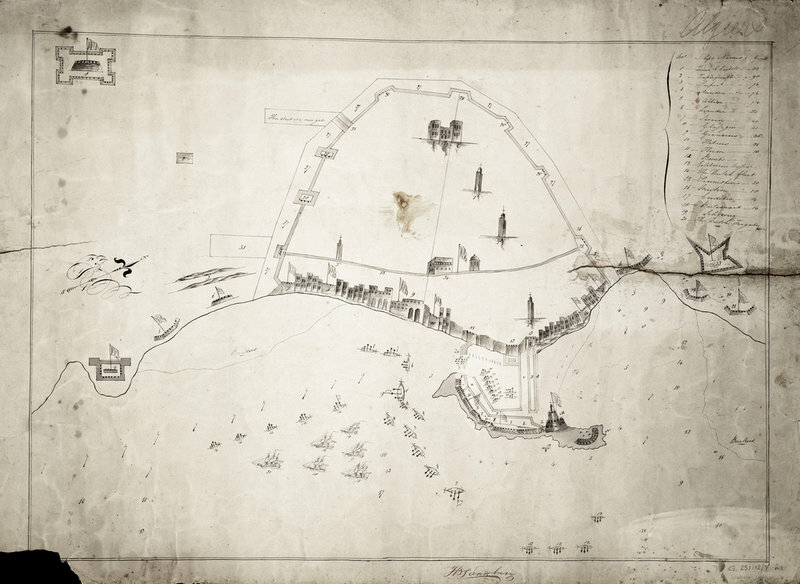 Exmouth decided to assign them to cover the main force from Algerian flanking batteries, as there was insufficient space in the mole for the Dutch frigates. The day before the attack, the frigate Prometheus arrived and its captain W. B. Dashwood attempted to secretly rescue the British Consul and his wife and infant. Some of the rescue party was discovered and arrested. The attack was described by the U.S. Consul. The plan of attack was for the larger ships to approach in a column. They were to sail into the zone where the majority of the Algerian guns could not be brought to bear. Then, they were to come to anchor and bombard the batteries and fortifications on the mole to destroy the defences. Simultaneously, HMS Leander—50 guns—was to anchor off the mouth of the harbour and bombard the shipping inside the mole. To protect Leander from the shore battery, frigates HMS Severn and Glasgow were to sail inshore and bombard the battery. Exmouth in Queen Charlotte anchored approximately 80 yd (73 m) off the mole, facing the Algerian guns. However, a number of the other ships anchored out of position, notably Admiral Milne aboard HMS Impregnable, who was 400 yards from where he should have been. This error reduced the effectiveness of these ships and exposed them to fiercer Algerian fire. Some of the other ships sailed past Impregnable and anchored in positions closer to the plan. The unfortunate gap created by the misplaced HMS Impregnable was closed by the frigate HMS Granicus and the sloop Heron. Painting by George Chambers Sr. In their earlier negotiations, both Exmouth and the Dey of Algiers had stated that they would not fire the first shot. The Dey's plan was to allow the fleet to anchor and then to sortie from the harbour and board the ships with large numbers of men in small boats. But Algerian discipline was less effective and one Algerian gun fired a shot at 15:15. Exmouth immediately began the bombardment. One sloop had been fitted out as an explosion vessel, with 143 barrels of gunpowder aboard, and Milne asked at 20:00 that it be used against the "Lighthouse battery", which was mauling his ship. The vessel was exploded, but to little effect and against the wrong battery. Despite this, the Algerian batteries could not maintain fire and, by 22:15, Exmouth gave the order for the fleet to weigh anchor and sail out of range, leaving HMS Minden to keep firing to suppress any further resistance. The wind had changed and was blowing from the shore, which helped the fleets depart. :395 By 01:30 the next morning, the fleet was anchored out of range. The wounded were treated, and the crew cleared the damage caused by the Algerian guns. Casualties on the British side were 128 killed and 690 wounded,:394 (16 percent killed or wounded). As a comparison, the British casualties at the Battle of Trafalgar had been only 9 percent. The allied squadron had fired over 50,000 round shot using 118 tons of gunpowder, and the bomb vessels had fired 960 explosive mortar shells. The translator of the letter Exmouth sent to the Dey left an eye-witness account of the damage done to the city, which he saw when he accompanied the letter under a flag of truce. The construction of the mole could not be discerned, neither could the positions where the batteries had been sited. No more than four or five guns that were still mounted were visible, and many fine houses had been destroyed. The bay was filled with the smoking hulks of the remains of the Algerine navy and by many floating bodies. "Sir, for your atrocities at Bona on defenceless Christians, and your unbecoming disregard of the demands I made yesterday in the name of the Prince Regent of England, the fleet under my orders has given you a signal chastisement, by the total destruction of your navy, storehouse, and arsenal, with half your batteries. As England does not war for the destruction of cities, I am unwilling to visit your personal cruelties upon the unoffending inhabitants of the country, and I therefore offer you the same terms of peace which I conveyed to you yesterday in my Sovereign's name. Without the acceptance of these terms, you can have no peace with England." He warned that if they were not accepted, then he would continue the action. The Dey accepted the terms, not realising that they were a bluff, as the fleet had already fired off almost all of its ammunition. A treaty was signed on September 24, 1816. The room it was signed in had been hit by nine round shot and was a perfect ruin. :395 The Dey freed 1,083 Christian slaves and the British Consul and repaid the ransom money taken in 1816, about £80,000. Over 3,000 slaves in total were later freed. Drescher notes Algiers as 'the sole case in the sixty years of British slave trade suppression in which a large number of British lives were lost in actual combat.' However, despite British naval efforts, it has been difficult to assess the long-term impact of the Bombardment of Algiers, as the Dey reconstructed Algiers, replacing Christian slaves with Jewish labour, and the Barbary slave trade continued under subsequent Deys (see Congress of Aix-la-Chapelle (1818)). ^ "Bombardment of Algiers by Anglo-Dutch Forces on August 26–27, 1816". ^ a b c d e f g h Porter, Maj Gen Whitworth (1889). History of the Corps of Royal Engineers Vol I. Chatham: The Institution of Royal Engineers. ^ Salamé, A. (1819) A Narrative of the Expedition to LAgiers in the Year 1816, John Murray, London, p. 63. Edwin John Brett, Brett's Illustrated Naval History of Great Britain, from the Earliest Period to the Present Time: A Reliable Record of the Maritime Rise and Progress of England (1871), Publishing Office, London. C. Northcote Parkinson, Britannia Rules: The Classic Age of Naval History 1793–1815 (1977), Weidenfeld and Nicolson. Seymour Drescher, Abolition: A History of Slavery and Antislavery (2009), Cambridge University Press. "Extract from Log book of HMS Severn". Wikimedia Commons has media related to Bombardment of Algiers. "Anglo-Dutch Bombardment of Algiers 1816". On War.